The Royal Mint have launched collector versions of one of their most popular coin series, entitled “Queen’s Beasts.” Following on the successes of the bullion-quality range of this heraldic series, which was launched last year and focuses on the mythical and real creatures that have featured over centuries in heraldry and the Royal Arms, this new range is produced in Proof quality for collectors. Over the coming years, the Royal Mint will profile 10 fearsome “Queen’s Beasts” that have stood guard throughout hundreds of years of British royal heraldry, by featuring them on an exciting new range of collectible coins. The griffins, dragons, and unicorns may be creatures of fantasy, but they can be seen hiding out in some surprisingly everyday places, from pub signs to passports, and on every official document of the Crown. The circulation-type £1 coins introduced in 1983 have featured, during various years, a classic version of the Royal Arms, with the Lion of England and the Scottish Unicorn holding the shield of the United Kingdom between them. The Queen’s Beasts can be spotted in sporting circles, with the three Lions of England and the rampant Lion of Scotland famously depicted on the shirts of their nations’ football teams. Other beasts in the collection will include the falcon, bull, yale, greyhound, and horse. The inspiration for this bullion series, which has become one of the Royal Mint’s more popular coin series, was taken from the Queen’s Beasts sculptures, each standing at around 2 meters (or six feet) tall. Originally created by James Woodford RA for the coronation ceremony of Her Majesty Queen Elizabeth II held in Westminster Abbey in 1953, the heraldic creatures symbolized the various strands of royal ancestry brought together in a young woman about to be crowned queen. Each beast, used as a heraldic badge by the generations that came before her, was inspired by the King’s Beasts of Henry VIII, which still line the bridge over the moat at his Hampton Court Palace. The Queen’s Beasts original sculptures have since been relocated to the Canadian Museum of History in Quebec, while Portland-stone replicas, also carved by James Woodford, watch over Kew Gardens in the United Kingdom. On the arms that represent Queen Elizabeth II and the United Kingdom, two beasts—the Scottish Unicorn and the English Lion— are shown supporting a quartered shield. The crowned golden Lion of England has been one of the supporters of the Royal arms since King James I came to the throne in 1603, but the symbol of a lion has stood for England far longer. Richard the Lion-heart, son of King Henry II, is famed for his three golden lions as the Royal Arms of England, and since the 12th century, lions have appeared on the coat of arms of every British sovereign. 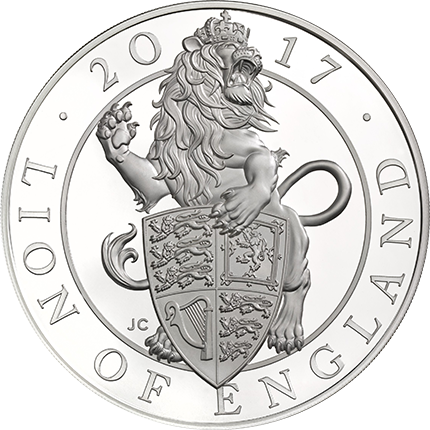 Designed by Royal Mint coin designer Jody Clark, the reverse side includes the Lion of England, which is the first of the beasts to be introduced for this new Proof coin series. 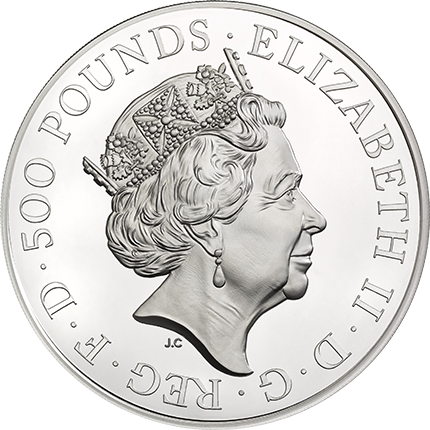 The obverse includes the fifth effigy of HM Queen Elizabeth II, also designed by Jody Clark and first introduced on British coinage in 2015. 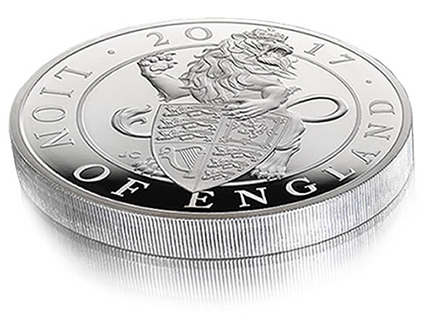 A first for the Royal Mint: the 10-ounce silver piedfort Proof. APMEX also carries the Queen’s Beasts bullion coins.